باراك حسين اوباما الثاني ( /bəˈrɑːk huːˈseɪn oʊˈbɑːmə/; و. 4 أغسطس 1961)، هو الرئيس الأمريكي رقم 44 والحالي. وهو أول أفريقي أمريكي يتقلد هذا المنصب. وُلد اوباما في هونولولو، هاواي، وتخرج من جامعة كلومبيا، وكلية الحقوق، جامعة هارڤرد، حيث كان رئيس هارڤرد لو رڤيو. وكان منظم مجتمعات في شيكاگو قبل حصوله على الدكتوراه في القانون. عمل مدعي حقوق مدنية في شيكاگو وكان أستاذ القانون الدستوري في كلية الحقوق، جامعة شيكاگو من 1991 حتى 2004. كان عضو مجلس شيوخ إلينوي ثلاث فترات عن الدائرة رقم 13 في الفترة من 1997 حتى 2004، وخسر في انتخابات مجلس النواب الأمريكي عام 2000. فاز اوباما في انتخابات مجلس الشيوخ في نوفمبر 2004. وفاز بمنصب الرئاسة في عام 2008 أمام المرشح الجمهوري جون مكين. أصبح رئيساً للولايات المتحدة في 20 يناير 2009. بعد عشرة شهور فاز بجائزة نوبل للسلام 2009. في نوفمبر 2012، أعيد انتخابه لفترة رئاسية ثانية، بعد فوزه على المرشح الجمهوري ميت رومني. باراك طفلا تحمله والدته آن دونام. ولد باراك حسين أوباما في هاواي لأب كيني مسلم كان يدرس في أحد برامج جامعة هاواي، وأم أميركية بيضاء من ولاية كانساس. انفصل الزوجان وكان باراك في الثانية من عمره ليعود الأب إلى كينيا، وتصبح الأم مسؤولة عن تربية الطفل. انتقل أوباما إلى جاكرتا صغيراً بعدما تزوجت أمه مهندس نفط إندونيسياً، حيث أنجبت أخته غير الشقيقة مايا، ويذكر الكاتب الروائي سكوت تورو أحد أصدقاء أوباما أنه في تلك الفترة انتظم مدة سنتين في مدرسة إسلامية ثم التحق بعد ذلك بمدرسة مسيحية كاثوليكية. اعتنق أوباما المسيحية بحسب طائفة كنيسة المسيح المتحدة. في عام 1995 كتب أوباما مذكراته بعنوان أحلام من أبي Dreams from My Father. وقد توفيت والدته بعد ذلك بعدة أشهر بمرض سرطان المبيض. من اليمين لليسار: باراك اوباما وأخته غير الشقيقة مايا سيوترو, ووالدتهما آن دونام وجدته ستانلي دونام, في هاواوي (اوائل السبعينيات). التحق أوباما بإحدى جامعات كاليفورنيا قبل أن ينتقل إلى جامعة كلومبيا في نيويورك، وتخرج فيها عام 1983 حاصلاً على البكالوريوس في العلوم السياسية والعلاقات الدولية، عمل بعدها في مجال العمل الأهلي لمساعدة الفقراء والمهمشين، كما عمل كاتبًا ومحللاً ماليًا لمؤسسة بزنس انترناشونال كوربوريشن. انتقل للإقامة في مدينة شيكاغو العام 1985 بعد أن حصل على وظيفة مدير مشروع تأهيل وتنمية أحياء الفقراء. في العام 1991 تخرج من كلية الحقوق بجامعة هارفارد، ودرس القانون محاضرًا في جامعة إلينوي في العام 1993. في العام 1996 انتخب أوباما لمجلس شيوخ ولاية إلينوي لينخرط بشكل رسمي في أنشطة الحزب الديمقراطي. في نوفمبر 2004 فاز في انتخابات الكونگرس عن ولاية إلينوي بنسبة 70 في المئة من إجمالي أصوات الناخبين في مقابل 27 في المئة لمنافسه الجمهوري، ليصبح واحداً من أصغر أعضاء مجلس الشيوخ الأمريكي سناً وأول سيناتور أسود في تاريخ مجلس الشيوخ الأمريكي. 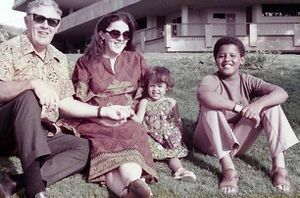 Obama on stage with his wife and two daughters just before announcing his presidential campaign on February 10, 2007. 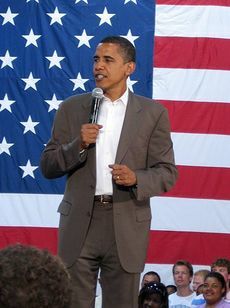 Obama speaking at a rally in Conway, South Carolina on August 23 2007. الجنرال ديڤيد پترايوس gives an aerial tour of Baghdad to Barack Obama and Chuck Hagel. اوباما يخطب في مظاهرة انقذوا دارفور أمام المول الوطني في واشنطن العاصمة في 30 أبريل 2006. Barack Obama takes the قسم منصب رئيس الولايات المتحدة. تولي باراك اوباما كالرئيس رقم 44، وجو بايدن كنائب الرئيس، حدث في 20 يناير 2009. In his first few days in office Obama issued executive orders and presidential memoranda directing the U.S. military to develop plans to withdraw troops from Iraq, and ordered the closing of the Guantanamo Bay detention camp "as soon as practicable and no later than" January 2010. Obama also reduced the secrecy given to presidential records and changed procedures to promote disclosure under the Freedom of Information Act. The president also reversed George W. Bush's ban on federal funding to foreign establishments that allow abortions (known as the Mexico City Policy and referred to by critics as the "Global Gag Rule"). 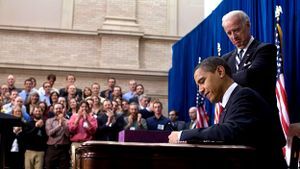 On January 29, 2009, President Obama signed his first bill into law, the Lilly Ledbetter Fair Pay Act of 2009, which overruled the Supreme Court's decision in Ledbetter v. Goodyear Tire & Rubber Co. and so eased the requirements for filing employment discrimination lawsuits. Five days later, he signed the reauthorization of the State Children's Health Insurance Program (SCHIP) to cover an additional 4 million children currently uninsured. 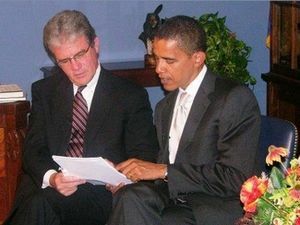 In March 2009, Obama repealed a Bush-era policy that prevented federal tax dollars from being used to fund research on new lines of الخلايات الجذعية الجنينية. Although such research had been a موضع خلاف, Obama stated that he believed "sound science and moral values...are not inconsistent," and that we have "the humanity and conscience" to pursue this research responsibly, pledging to develop "strict guidelines" to ensure that. On May 26, 2009, Obama nominated Sonia Sotomayor to replace retiring Associate Justice David Souter. Sotomayor was confirmed on August 6, 2009 by a vote of 68-31, becoming the first Hispanic to be a Supreme Court Justice. She joins Ruth Bader Ginsburg as one of two women on the Court and is the third woman ever to be a Justice. On September 30, 2009, the Obama administration announced new regulations on power plants, factories and oil refineries in an attempt to limit greenhouse gas emissions and to curb global warming. 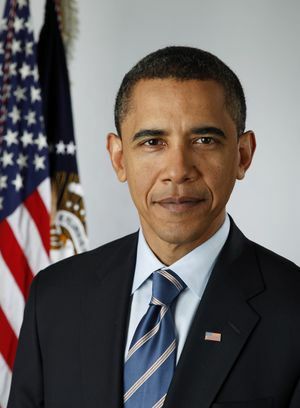 On February 17, 2009, Barack Obama signed into law the American Recovery and Reinvestment Act of 2009, a $787 billion economic stimulus package aimed at helping the economy recover from the deepening worldwide recession. Obama made a high-profile visit to Capitol Hill to engage with Congressional Republicans, but the bill ultimately passed with the support of only three Republican senators. The act includes increased federal spending for health care, infrastructure, education, various tax breaks and incentives, and direct assistance to individuals, which is being distributed over the course of several years, with about 25% due by the end of 2009. In June, Obama, unsatisfied with the pace of the investment, called on his cabinet to accelerate the spending over the next weeks. In September, Obama argued that the stimulus package helped stop the economic downturn. President Barack Obama signs the ARRA into law on February 17, 2009 in Denver, كولورادو. Vice President Joe Biden stands behind him. In March, Obama's Treasury Secretary, Timothy Geithner, took further steps to manage the financial crisis, including introducing the Public-Private Investment Program which contains provisions for buying up to $2 trillion in depreciated real estate assets that were deemed to be weighing down stock valuations, freezing the credit market and delaying economic recovery. On March 23, The New York Times noted that "(i)nvestors reacted ecstatically, with all of the major stock indexes soaring as soon as the markets opened." Along with spending and loan guarantees from the Federal Reserve and the Treasury Department, about $11.5 trillion had been authorized by the Bush and Obama administrations, with $2.7 trillion actually spent by the end of June 2009. Obama intervened in the troubled automotive industry in March, renewing loans for General Motors and Chrysler Corporation to continue operations while reorganizing. Over the following months the White House set terms for both firms' bankruptcies, including the sale of Chrysler to Italian automaker Fiat and a reorganization of GM giving the U.S. government a temporary 60% equity stake in the company, with the Canadian government shouldering a 12% stake. الرئيس الأمريكي باراك أوباما ومعاونيه يشاهدون خطاب تنحي مبارك، مباشرة بعد مكالمة استمرت ساعة لأوباما مع مبارك. وبينما الشعب كان هايص في ميدان التحرير تم في قصر العروبة تسليم السلطة من مبارك إلى المجلس العسكري، بإشراف أمريكا. In February and March, Vice President Joe Biden and Secretary of State Hillary Rodham Clinton made separate overseas trips to announce a "new era" in U.S. foreign relations with Russia and Europe, using the terms "break" and "reset" to signal major changes from the policies of the preceding administration. Obama's granting of his first television interview as president to an Arabic cable network, Al Arabiya, was seen as an attempt to reach out to Arab leaders. On March 19, Obama continued his outreach to the Muslim world, releasing a New Year's video message to the people and government of Iran. This attempt at outreach was rebuffed by the Iranian leadership. In April, Obama gave a speech in Ankara, Turkey which was well received by many Arab governments. 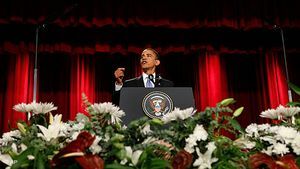 On June 4, 2009, Obama delivered a speech at Cairo University in Egypt calling for "a new beginning" in relations between the Islamic world and the United States and promoting Middle East peace. On June 26, 2009, in response to the Iranian government's actions towards protesters following Iran's 2009 presidential election, Obama said: "The violence perpetrated against them is outrageous. We see it and we condemn it." On July 7, while in Moscow, he responded to a Vice President Biden comment on a possible Israeli military strike on Iran by saying: "We have said directly to the Israelis that it is important to try and resolve this in an international setting in a way that does not create major conflict in the Middle East." During his presidential transition, الرئيس المنتخب Obama announced that he would retain the incumbent Defense Secretary, Robert Gates, in his Cabinet. Early in his presidency, Obama moved to change the perception of U.S. war strategy by planning to decrease troop levels in Iraq as was planned in the closing days of the Bush administration. On February 27, Obama declared that combat operations would end in Iraq within 18 months. His remarks were made to a group of Marines preparing for deployment to Afghanistan. Obama said, "Let me say this as plainly as I can: By August 31, 2010, our combat mission in Iraq will end." Early in his presidency, Obama moved to change U.S. war strategy by increasing troop strength in Afghanistan. On February 18, 2009, Obama announced that the U.S. troop strength in Afghanistan would be boosted by 17,000, asserting that the increase was necessary to "stabilize a deteriorating situation in Afghanistan", an area he said had not received the "strategic attention, direction and resources it urgently requires". 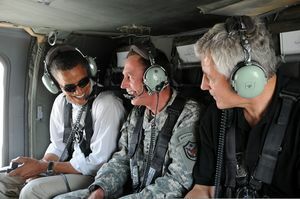 On May 11, Obama replaced his military commander in Afghanistan, General David D. McKiernan, with former Special Forces commander Lt. Gen. Stanley A. McChrystal, believing that Gen. McChrystal's Special Forces experience would facilitate the use of counterinsurgency tactics in the war. Obama has called for Congress to pass health care reform, a key campaign promise and a top legislative goal. On July 14, 2009, House Democratic leaders introduced a 1,017 page plan for overhauling the US health care system, which Obama wants Congress to approve by the end of the year. Obama has also stated that a public health insurance option is a main component to lowering costs and improving quality in the health care sector. After much public debate during the Congressional summer recess of 2009, Obama delivered a speech to a joint session of Congress on September 9 where he addressed concerns over his administration's proposals. حملة اوباما في بنسلفانيا, اكتوبر 2008. 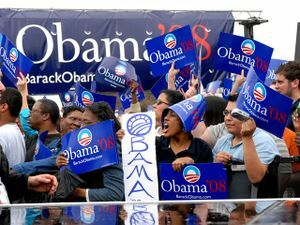 Obama supporters at a campaign rally in Austin, Texas, on February 23 2007. باراك اوباما وعائلته أثناء الاحتفال بفوزه بفترة رئاسية ثانية، نوفمبر 2012. باراك اوباما وزوجته ميشل اوباما. في 5 نوفمبر 2008 تم الاعلان عن انتخابه رئيساً للولايات المتحدة الأمريكية بعد منافسة مع السيناتور جون ماكين، ليكون بذلك أول أمريكي من أصول أفريقية يتولى هذا المنصب. وقد أعلن عن فوزه بالرئاسة قبل ظهور نتائج ولايات الساحل الغربي للولايات المتحدة، حيث تخطى بسرعة حاجز ال 270 صوتاً في المجمع الانتخابي اللازمة لدخول البيت الأبيض بعد فوزه بولايات حاسمة مثل فرجينيا وأوهايو وبنسلفانيا، وفاز أيضاً بولايات كلورادو وكاليفورنيا وأيوا وفيرمونت والعاصمة واشنطن وكونيتيكت وميريلاند وماساتشيوستس وماين ونيوجيرسي وديلاوير ونيوهامبشاير وإلينوي ونيويورك وويسكونسن ورود أيلاند ومينيسوتا ونيو ميكسيكو وهاواي وأوريجون. وبحسب آخر تقديرات حصلت عليها بي بي سي وصل فوزه إلى 349 صوتاً في المجمع الانتخابي مقابل 162 لماكين. Obama, Barack. 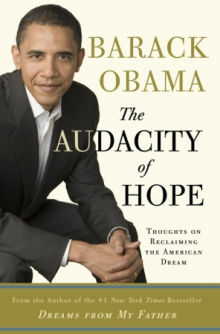 The Audacity of Hope: Thoughts on Reclaiming the American Dream, Crown, 2006. ISBN 0-307-23769-9. Fight the Smears: the candidate's responses to Internet rumors. ^ Foster, Jessica (August 24 2007). 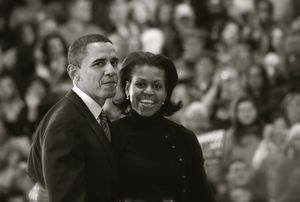 "Obama Impresses Crowd at CCU". Sun News. MyrtleBeachOnline. Retrieved 2008-01-14. Check date values in: |date= (help) Video at Brightcove.TV. ^ "Obama asks Pentagon for responsible Iraq drawdown". China Daily. January 23, 2009. Retrieved September 4, 2009. ^ Glaberson, William (January 21, 2009). "Obama Orders Halt to Prosecutions at Guantánamo". The New York Times. Retrieved February 3, 2009. ^ "Executive Order—Presidential Records". Retrieved January 22, 2009. ^ Doyle, Michael (January 23, 2009). "Obama restores some of the 'Freedom' to FOIA". McClatchy Newspapers. Retrieved January 24, 2009. ^ Gerstein, Josh (January 24, 2009). "Obama: End Abortion 'Politicization'". Politico.com. ^ "Obama Signs Equal-Pay Legislation". New York Times. Retrieved June 15, 2009. 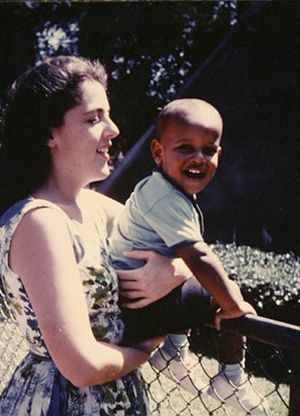 ^ "Obama signs into law expansion of SCHIP health-care program for children". Chicago Tribune. Retrieved June 15, 2009. ^ "Senate confirms Sotomayor for Supreme Court". CNN.com. 6 August 2009. Retrieved 6 August 2009. 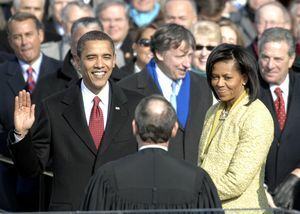 ^ Obama nominates Sotomayor to Supreme Court, CNN, accessed May 26, 2009. ^ "Stimulus package en route to Obama's desk". CNN. Turner Broadcasting System, Inc. Retrieved March 29, 2009. 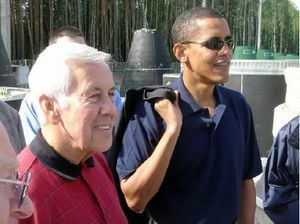 ^ "Obama Presses Cabinet to Speed Stimulus Spending". Wall Street Journal. June 9, 2009. ^ Goldman, David (2009). "CNNMoney.com's bailout tracker". Bailout tracker. p. 20. Retrieved June 20, 2009. ^ "White House questions viability of GM, Chrysler". The Huffington Post. March 30, 2009. ^ "Chrysler and Union Agree to Deal Before Federal Deadline". 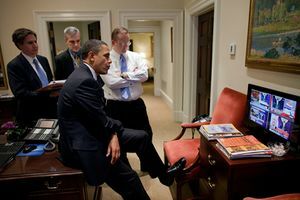 ^ "Obama reaches out to Muslim world on TV". MSNBC. Retrieved June 15, 2009. ^ "washingtonpost.com> Nation U.S. to Join Talks on Iran's Nuclear Program". The Washington Post. Retrieved June 15, 2009. ^ "Iranian Leaders Ignore Obama's Outstretched Hand". Fox News Channel. Retrieved June 15, 2009. ^ "Obama speech draws praise in Mideast". The Guardian. Retrieved June 15, 2009. ^ "Obama dismisses Ahmadinejad apology request". The Washington Times. June 26, 2009. ^ Chidanand Rajghatta, "Barack 'No Bomb' Obama pushes for world without nukes", Times of India, September 24, 2009. ^ "Will Gates Stay or Go?". MSNBC. November 10, 2008. ^ Feller, Ben (February 27, 2009). "Obama sets firm withdrawal timetable for Iraq". The Detroit News. CAMP LEJEUNE, N.C. Associated Press. Retrieved March 3, 2009. ^ Hodge, Amanda (February 19, 2009). "Obama launches Afghanistan Surge". The Australian. ^ "Obama will hedge on public option" - Politico.com. Retrieved September 9, 2009. ^ "Obama presents health plan, attacks 'scare tactics'" - CNN.com. Retrieved September 9, 2009. ^ Morris, Chris (2006-09-06). "U2 goes 5-for-5 at Grammys". The Hollywood Reporter. Retrieved 2008-09-20. ^ Associated Press (2008-02-10). "Obama beats ex-presidents for audiobook Grammy". Toronto Star. Retrieved 2008-02-10.